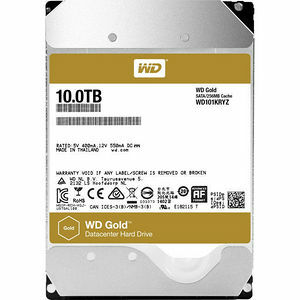 With up to ten times the workload capacity of desktop drives, WD Gold™ hard drives employ advanced technology to deliver among the best in reliability, capacity, power efficiency and performance. Designed for a multitude of Datacenter-specific applications, WD Gold™ hard drives are perfect for high-availability server and storage arrays that demand the most robust storage device available with 24/7 premium customer support. Full range of nearline capacities - From entry-level servers to high end enterprise storage systems, WD Gold™ hard drives offer the capacities required for the most demanding datacenter environments. High workload capability - Delivering both performance and reliability to any datacenter environment, WD Gold™ hard drives are designed to handle workloads up to 550TB per year which is among the highest workload capability of any 3.5-inch hard drive. High level of reliability - With up to 2.5 million hours MTBF, WD Gold™ hard drives deliver one of the highest levels of reliability and durability for yearly operation (24x7x365) within the most demanding storage environments. Vibration Protection - Enhanced RAFF™ technology includes sophisticated electronics to monitor the drive and correct both linear and rotational vibration in real time. The result is a significant performance improvement in high vibration environments over our desktop hard drives. RAID-specific, time-limited error recovery (TLER) - Reduces drive fallout caused by the extended hard drive error-recovery processes common to desktop drives. Dynamic fly height technology - Each read-write head's fly height is adjusted in real time for optimum reliability. All WD Gold™ hard drives are extensively tested across a variety of popular OEM storage systems, SATA controllers, and host bus adapters, to ensure ease of integration for a plug and play solution. Dedicated 24x7 over the phone support is included with every WD Gold™ hard drive.